Arvanian (former Arvanov), V. (2013). Rat Model of Chronic Midthoracic Lateral Hemisection. Bio-protocol 3(18): e912. DOI: 10.21769/BioProtoc.912. Hunanyan, A. S., Garcia-Alias, G., Alessi, V., Levine, J. M., Fawcett, J. W., Mendell, L. M. and Arvanian, V. L. (2010). Role of chondroitin sulfate proteoglycans in axonal conduction in mammalian spinal cord. J Neurosci 30(23): 7761-7769. Although most spinal cord injuries (SCI) are anatomically incomplete, only limited functional recovery has been observed in people and rats with partial lesions. To address why surviving fibers cannot mediate more complete recovery, it is important to evaluate the physiological and anatomical status of spared fibers. These experiments require use of animal models. Here we describe a midthoracic unilateral spinal cord hemisection (HX; corresponds to Brown-Sequard lesion in humans) in adult rats. This is a useful animal model for partial injuries because there is a clear lesion of one entire side of the cord with intact fibers remaining on the contralateral side. This model allows the study and comparison of how acute and chronic trauma affect function of the surviving fibers. Note: All procedures were performed on adult female Sprague Dawley rats (~200 g) in compliance with the Institutional Animal Care and Use Committee at SUNY-Stony Brook and Northport VAMC. After pre-training on the behavioral tasks, rats were deeply anesthetized with 3% isoflurane in 100% O2 in an induction chamber (1 L). Anesthesia was maintained by administering 1.5% isoflurane in 100% O2 through a face mask. A water circulating heating pad was used to maintain body temperature at 36.5-37 °C during surgeries. Before surgery, animals received a subcutaneous injection of analgesic Buprenorphine (0.01 mg/kg) to reduce post-operative pain. Petrolatum ophthalmic ointment was applied to the eyes to prevent desiccation. Dorsal laminectomy (i.e. partial vertebral laminectomy) was performed to expose T10 spinal segment. The spinal level was confirmed by using a vein at T5-T6 as a landmark. The meningeal layer at T10 was slit (1 mm) at the midline longitudinally. Finally, while keeping the cord elevated, one tip of the scissors was placed under the ventral surface of the spinal cord (up to the midline) and any uncut tissue in the left dorsal and ventral columns was cut ventral to dorsal up to the midline. Figure 1. Images of spinal cord following dorsal laminectomy and lateral HX lesion of the spinal cord. A. 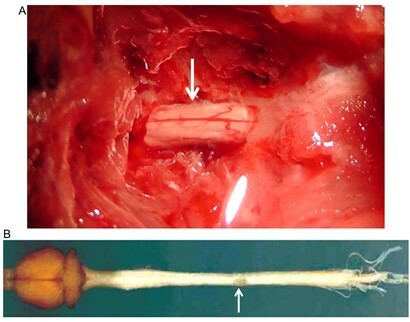 Image of the exposed spinal cord (at arrow) following a dorsal laminectomy procedure. B. Image of rat brain and spinal cord isolated from the rat that recived HX spinal cord injury (at arrow) 6 weeks erlier. After surgery, the muscles were closed with 4-0 monocryl suture and skin was closed with wound clips. Antibiotic (5 mg/kg, sc) and 5 ml of lactated Ringer’s solution were administered subcutaneously. Bladder function was not compromised by this surgery. Injections of antibiotic, analgesic and Ringer`s solution were administered for 3 days post injury. Horizontal or transverse sections of the spinal cord were used for reconstruction of injury (Figure 2). Figure 2. Lateral HX spinal cord injury. A. Horizontal section of the rat spinal cord prepared immediately after HX. B. Transverse section of the cord at SCI epicenter prepared 6 weeks after HX; highlighted is area of spared white matter. Scale bar, 100 μm. (Adopted and modified from Garcia-Alias et al., 2011). As a result of HX SCI, there are clear behavioral impairments revealed by challenging motor tasks and automated Catwalk gait analysis; electrophysiological experiments allow evaluation of the conduction through fibers contralateral to the lesion and the possibility of establishing a functional detour around the lesion following administration of various treatments; moreover, unilateral injections of the anatomical tracers permit visualization of anerogradely labeled midline crossing fibers and retrogradely labeled neurons (Arvanian et al., 2009; Hunanyan et al., 2010; Schnell et al., 2011; Garcia-Alias et al., 2011; Hunanyan et al., 2011; Petrosyan et al., 2013). This protocol was adapted from previously published papers: Arvanian et al. (2009); Hunanyan et al. (2011); García-Alías et al. (2011); Schnell et al. (2011). The research was supported by Merit Review Funding from the Department of Veterans Affairs and the Department of Defense and New York State Spinal Cord Injury Research Board. Arvanian, V. L., Schnell, L., Lou, L., Golshani, R., Hunanyan, A., Ghosh, A., Pearse, D. D., Robinson, J. K., Schwab, M. E., Fawcett, J. W. and Mendell, L. M. (2009). Chronic spinal hemisection in rats induces a progressive decline in transmission in uninjured fibers to motoneurons. Exp Neurol 216(2): 471-480. Garcia-Alias, G., Petrosyan, H. A., Schnell, L., Horner, P. J., Bowers, W. J., Mendell, L. M., Fawcett, J. W. and Arvanian, V. L. (2011). Chondroitinase ABC combined with neurotrophin NT-3 secretion and NR2D expression promotes axonal plasticity and functional recovery in rats with lateral hemisection of the spinal cord. J Neurosci 31(49): 17788-17799. Hunanyan, A. S., Alessi, V., Patel, S., Pearse, D. D., Matthews, G. and Arvanian, V. L. (2011). Alterations of action potentials and the localization of Nav1.6 sodium channels in spared axons after hemisection injury of the spinal cord in adult rats. J Neurophysiol 105(3): 1033-1044. Petrosyan, H. A., Hunanyan, A. S., Alessi, V., Schnell, L., Levine, J. and Arvanian, V. L. (2013). Neutralization of inhibitory molecule NG2 improves synaptic transmission, retrograde transport, and locomotor function after spinal cord injury in adult rats. 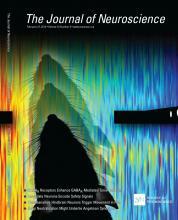 J Neurosci 33(9): 4032-4043. Schnell, L., Hunanyan, A. S., Bowers, W. J., Horner, P. J., Federoff, H. J., Gullo, M., Schwab, M. E., Mendell, L. M. and Arvanian, V. L. (2011). Combined delivery of Nogo-A antibody, neurotrophin-3 and the NMDA-NR2d subunit establishes a functional 'detour' in the hemisected spinal cord. Eur J Neurosci 34(8): 1256-1267.